For the Rushden & Diamonds footballer, see Chris Hope (footballer). Not to be confused with Chris Hoke. Christopher Pierre Hope (born September 29, 1980) is a former American football safety in the National Football League (NFL). He played college football for Florida State University. 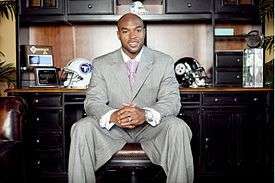 He was drafted by the Pittsburgh Steelers in the third round of the 2002 NFL Draft, and has also played for the Tennessee Titans and Atlanta Falcons. He helped the Steelers win Super Bowl XL against the Seattle Seahawks. Hope was a USA Today All-USA first-team and Parade All-American selection as a senior at Rock Hill High School. During his High School Career Chris Hope recorded 114 tackles and three interceptions as a defensive back while rushing for 1319 yards and 20 touchdowns as a running back. He totaled 464 tackles, 10 interceptions and four fumble recoveries during his four-year varsity career and established a school record as he started 55-straight games during his star-studded prep career. Ranked as No. 1 defensive back prospect in the nation by Prep Star and rated No. 3 defensive back and No. 50 overall prospect in America by National Recruiting Advisor, he was a member of Atlanta Journal-Constitution Super Southern 1000. Selected to Orlando Sentinel All-Southern team. Rated as No. 1 defensive back recruit nationally by Tampa Tribune and ranked as sixth-best recruit nationally by St. Petersburg Times. Recorded 114 tackles and three interceptions as defensive back while rushing for 1,319 yards and 20 touchdowns as running back. While attending Florida State University, Hope played for the Florida State Seminoles football team. In 1998, freshman year at FSU, he played in every game at free safety, recording 34 tackles, with a pair of pass deflections, a fumble recovery, and a forced fumble. In 1999, Sophomore year, he played in every game, starting the final six contests at free safety recording 41 tackles, with two stops for losses of 4 yards, and a forced fumble. He also tied for the team lead with four interceptions for 17 yards in returns. In 2000, Junior year, Chris Hope started all year at free safety. He was fourth on the team with 83 tackles, including five stops for losses of 10 yards, intercepted two passes and deflected eight others, recovered and caused a fumble. In 2001, Senior year, Chris Hope started every game at free safety. He recorded 76 tackles with nine pass deflections and three interceptions. Chris Hope during a game in 2005 (right). Chris Hope was drafted in the third round number 94th overall by the Pittsburgh Steelers for the 2002 season. He started out the 2002 season on special teams and became a strong special teams player. In an October 27 game against the Baltimore Ravens he caused a fumble on a second quarter kickoff that led to a touchdown. He got to play his first extensive game on November 24, 2002, against Cincinnati due to injuries in the Steelers secondary picking up three tackles and one special teams tackle. The 2003 season was not much different from his first. Chris Hope played mainly special teams. In an October 26, 2003, game against St. Louis he delivered a crushing block to free Antwaan Randle El to return a punt 84 yards. In 2004 Chris Hope became the starting free safety for the Pittsburgh Steelers. Chris Hope would pick up 58 tackles forcing one fumble, four pass deflections, and intercept one pass with a return of 41 yards. In 2005 Chris Hope would once again start as Free Safety for the Pittsburgh Steelers. He had 69 tackles forcing one fumble, and he picked off 3 passes with a total of 60 return yards. Chris Hope was one of the many who helped the Pittsburgh Steelers reach and win Super Bowl XL. Shortly thereafter, Hope signed a six-year contract with the Tennessee Titans. In his first year, he led the team with five interceptions and 128 tackles. In a 2007 game against Cincinnati, Hope suffered a spinal cord injury that ended his season. He underwent surgery in the offseason and has been a full participant at the Titans minicamp. On June 29, 2012 Hope signed with the Atlanta Falcons. Hope made his mark with special teams leading with team tackles. Chris Hope was signed by the Detroit Lions on June 24, 2013. With the signing Chris Hope has reunited with head coach Jim Schwartz. Hope was coached by Schwartz in Tennessee, where he earned a pro bowl spot in 2008. On August 25, 2013, Hope was released by the Detroit Lions. Favorite Bible Scripture Romans 5:3-4 - And not only so, but we glory in tribulations also: knowing that tribulation worketh patience; perseverance, character; and character, hope. Favorite Book of Mormon Scripture 2 Nephi 2:8 - Wherefore, how great the importance to make these things known unto the inhabitants of the earth, that they may know that there is no flesh that can dwell in the presence of God, save it be through the merits, and mercy, and grace of the Holy Messiah, who layeth down his life according to the flesh, and taketh it again by the power of the Spirit, that he may bring to pass the resurrection of the dead, being the first that should rise. Hope is married to Linda De La Cruz Hope, proprietor of The L in Luxury Real Estate. ↑ "Chris Hope, FS - Florida State.". USA Today. Retrieved 2001-04-22. ↑ Meinke, Kyle (August 25, 2013). "Detroit Lions cut 4 more players, including former 4th-rounder Ronnell Lewis". MLive.com. Retrieved August 30, 2013. ↑ "Chris Hope Stats". ESPN. ESPN Internet Ventures. Retrieved 12 January 2015. ↑ http://ichope24.com/ichope.html|title=Chris Hope Official Website.